District attorneys, sheriffs, and other law enforcement officials wield immense power over the criminal justice system. A series of paradigm-shifting victories for candidates championing significant reform has reshaped district attorney and sheriff elections, and issues relating to mass incarceration, police misconduct, and immigration enforcement have grown more salient in many other types of races as well. In The Appeal: Political Report, I will highlight often-overlooked but highly consequential local elections, drawing out their stakes, contrasts, and repercussions. My hope is to make this newsletter a useful platform for anyone looking for a succinct but systematic overview of our fragmented local landscapes—and I’ll link to additional resources for those looking to delve deeper. Today, I’ll be exploring a series of competitive primaries taking place tomorrow, June 26. These races have elicited some meaningful disagreements between candidates on issues such as immigration detentions, police brutality, and cash bail reform. I’ll lay out results in the newsletter’s next edition. In the meantime, you can find out the outcome of each election I discuss below as soon as it is known (no earlier than the night of Tuesday, June 26) in this database. In these interviews, Dougherty and Foote both back pursuing diversion programs for offenses like drug possession, limiting cooperation with ICE, and releasing demographic data on cases they process. But while they both espouse a goal of minimizing cash bail, they differ in their views of how to do so. Dougherty says that he “would like to” emulate other DAs who have instructed prosecutors to never seek cash bail for some misdemeanors; but Foote does not voice support for this when the ACLU asks him about similarly limiting his prosecutors’ discretion to seek cash bail, explaining that he would instead grant prosecutors “more discretion” to act as they deem wise in individual cases. The two disagree as well over whether to compel the disclosure of closed police files once a police misconduct investigation is completed, with Dougherty but not Foote indicating support for state legislation that would have done so. In his answers to the ACLU, Dougherty also calls for the creation of a central database of police personnel files so that these remain accessible when an officer moves from one agency to another, and endorses methods of circumventing immigration authorities such as impromptu changes to court hearing schedules. On the campaign trail itself, the defining fault line has involved Foote’s promise to aggressively prosecute polluters for violating air and water quality; Dougherty holds that district attorneys have little authority over environmental crimes. 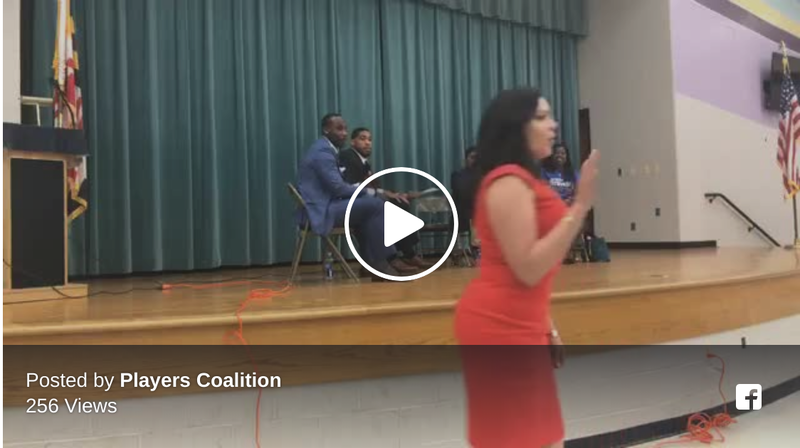 A public forum featuring Players Coalition members Anquan Boldin and Carl Davis asking state’s attorney candidates about their positions on criminal justice issues. The current state’s attorney of Prince George’s County (a populous African-American-majority county situated in the suburbs of Washington, D.C.) is running for county executive, and Maryland advocates have viewed the race to replace her as an opportunity to press for change. In a recent op-ed in the Washington Post, the executive director of Progressive Maryland, Larry Stafford, laid out a range of areas—from the preponderance of pretrial detention and the insufficiency of diversion programs to officials’ attitude toward marijuana—that a new state’s attorney could transform. Moreover, Vignarajah is the only one of the two to answer in the affirmative on a number of other questions, including whether he commits to not seeking life without parole sentences for juvenile sentences, to fighting the automatic charging of juvenile defendants as adults, and to more often refraining from seeking maximum sentences. Bates, meanwhile, has campaigned on reducing incarceration for low-level offenses, and simultaneously on prosecuting people charged with violent offenses more aggressively than Mosby has. He disagreed with Vignarajah at a recent debate on predictive policing tools, which Bates criticized as as conducive to racial discrimination. On the campaign trail, Mosby has repeatedly attacked Bates for his work as a defense lawyer. “I didn’t become a defense attorney and defend robbers and rapists,” she said during one debate, a statement that drew direct criticism from Baltimore City Council member Ryan Dorsey. Following the death of Terence Crutcher, an unarmed Black man shot by a police officer in 2016, Tulsa County District Attorney Steve Kunzweiler pressed charges against the officer who shot him, Betty Shelby. But Shelby was acquitted in 2017, and her prosecution is now a central issue in the Republican primary for Tulsa County district attorney. Kunzweiler faces Ben Fu and Tammy Westcott, both former employees of the district attorney’s office. The Tulsa Fraternal Order of Police (FOP), which has warred with Kunzweiler since he charged Shelby, has endorsed Fu. Fu faults Kunzweiler for making the Tulsa police feel unsupported and for “erod[ing] the public’s faith in that institution,” as his website puts it, and says that he would have behaved differently. For one, Fu says that he would have waited to see the results of an internal investigation by the Tulsa Police Department, whereas Kunzweiler acted based on a report produced within the district attorney’s office. Kunzweiler has also faced attacks for questioning the practice of allowing police officers under investigation to take 72 hours before giving a statement. Complicating matters, Fu has also campaigned against what he calls a “culture of overcharging.” He says that he will devote more resources to “alternatives to mass incarceration,” including for drug-related offenses. Whereas Kunzweiler opposed a state proposal to make simple drug possession a misdemeanor instead of a felony, Fu has responded that district attorneys should “find a way to inspire [defendants] without having to have the ‘stick’ of prison hanging over their heads.” In addition, Kunzweiler has sought to attack Fu’s standing as a police champion by going after him over a client he was defending, a teenager accused of firing at police officers; Fu then dropped this defendant, just days after receiving the local FOP’s endorsement. Criminal justice reform front-and-center in New York’s 14th Congressional District: In challenging Representative Joe Crowley in the Democratic primary of this Queens- and Bronx-based district, Alexandria Ocasio-Cortez has campaigned on a goal of reducing the country’s prison population by 50 percent. She was also among the first congressional candidates to call for the abolition of ICE, a stance with which Crowley disagrees. Crowley and Ocasio-Cortez do share many important reform proposals, including closing Rikers Island, expunging past marijuana convictions, closing private prisons, and adopting Medicare for All. Ocasio-Cortez and advocates who support her fault Crowley for being insufficiently active in pushing for such positions, and for backing measures that contradict them, such as the “Blue Lives Matter” bill opposed by organizations like the ACLU and the NAACP that overwhelmingly passed the House in May. Ocasio-Cortez also ties the fight against mass incarceration with a reduction in economic marginalization through proposals like a federal jobs guarantee. Dan Donovan challenged in New York’s 11th Congressional District: When Michael Grimm resigned from Congress after pleading guilty to tax fraud in 2014, the Republican Party coalesced around Dan Donovan, who was then the District Attorney of Richmond County. Just months earlier, Donovan had wrapped up his investigation into Eric Garner’s death without bringing any indictment—a failure that led to widespread protests and activism in New York City and across the country. But it never became an issue in this congressional campaign, and Donovan easily won in May 2015. Fast-forward three years: Grimm is mounting a comeback for his old seat, using a campaign style that has been compared to Donald Trump’s, and he is locked in a very competitive Republican primary with Donovan. President Trump has tweeted an endorsement of Donovan. Unsurprisingly, given that Grimm congratulated Donovan for his handling of the Garner grand jury in 2014, Donovan’s actions in this case have once again not emerged as an issue within this primary. Thanks for reading. We’ll see you on July 9. Don’t forget to subscribe!